I heard the news this morning that Jim Marshall has died. Today's date, much like March 21st, 1991 (the day Leo Fender died) will be one that I remember for a long time. Jim Marshall was one of the fathers of "the sound." Along with Leo Fender and Les Paul, he was one of the visionaries that helped forge the early days of rock and roll. 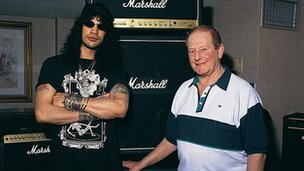 Rather a lot of us in the world of rock and metal owe a lot of our sound today to Jim Marshall (and Leo; and Paul). I have two Marshall amps at home. A VS 120/120 which I use for a stereo effected guitar rack and a 1965 "Plexi". The Plexi is a beast beyond description; loud, amazing and crushing all at once. It was a gift to me from a friend and fellow musician and I've cherished it ever since. When I took it into the recording studio we actually had to put it in a separate sound room to record it. It sings right around six to eight on the dial but at that volume it's harmful to life. Or at least ears. We plugged a mid-60s Gibson ES-335 into it and recorded the lines for the song Visions with that rig. It was an amazing pairing. Thank you Mr. Marshall for all you have given us. We are in your debt.